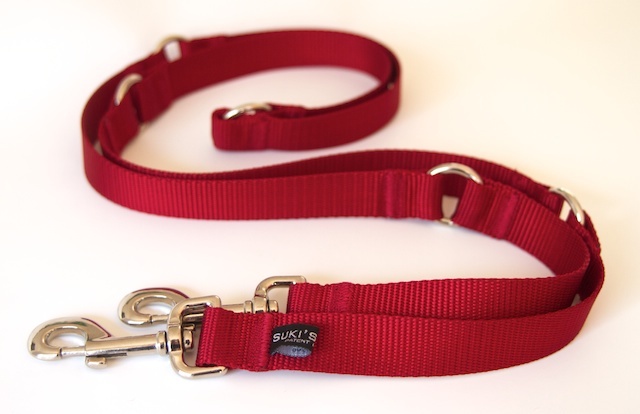 Suki’s Lead, a brand new line of dog leashes, is announcing their website grand opening to showcase their patented lead/coupler. “With many cities giving way to more freedoms for dogs, there is a new demand for a leash that adapts,” says owner Enzia Farrell. “This leash was created for exactly that purpose.” Without detaching the leash from the dog, the human end of the leash cab be attached to or around almost anything. With it’s multiple attach points allowing a dog owner so many possibilities that they are impossible to list as new ways to use it are constantly being realized. Recently, Los Angeles is now allowing dogs in outdoor eating areas with their owners. Gone are the days where dogs have to be on the other side of a fenced in area. With new freedoms, arise new needs for a different lead. 6 segment leashRed 6 segment leash more than 6ft. long.